"I have served this to many a friend from the South, and it is always a winner! Serve with coleslaw and oven-baked french fries, and you'll have a healthy, tasty meal!" Preheat an oven to 425 degrees F (220 degrees C). Grease a 13x9 glass baking dish with the oil, and set aside. Rinse the catfish fillets, and pat dry. In a shallow bowl, combine the cornmeal, creole seasoning, paprika, sugar, and black pepper. Combine the eggs and hot sauce or water in a another bowl. Dip the fillets in the egg mixture, dredge in the cornmeal mixture, and arrange in the baking pan. Bake for 15 minutes, or until cooked through and golden brown. Turn once during cooking. Place catfish on a paper-towel lined plate, and serve immediately with additional hot sauce. The nutrition data for this recipe includes the full amount of the breading ingredients. The actual amount of the breading consumed will vary. This was a simple and easy recipe to follow. 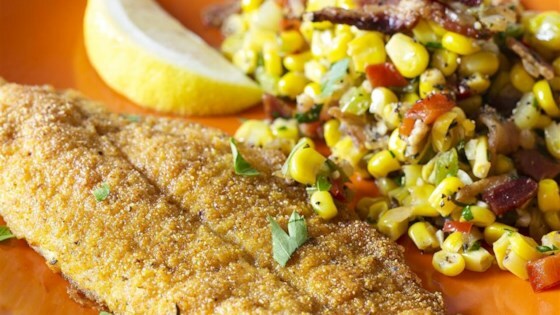 I had all the ingredients on hand and it was a healthy alternative to fried catfish. It was tasty and not overpowering. Perfect! I used an extra 1/ 2 pound of catfish and cooked for 25 minutes and it came out great. Leftovers make great sandwiches on a whole wheat bun with mayo.